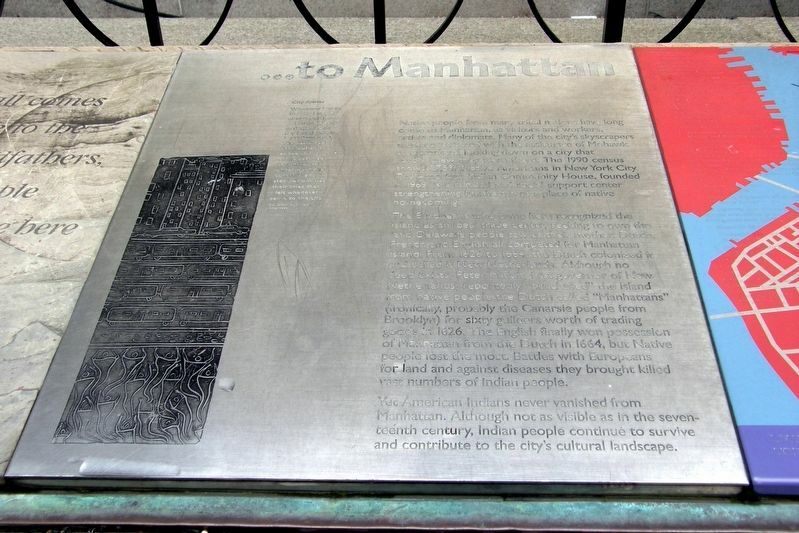 Native people from many tribal nations have long come to Manhattan as visitors and workers, artists and diplomats. 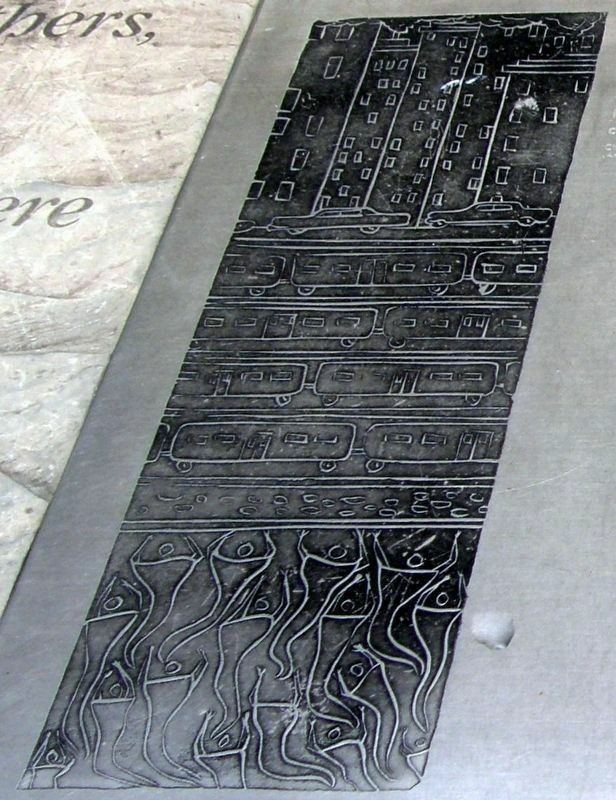 Many of the city’s skyscrapers were constructed with the assistance of Mohawk steel workers looking down on a city that hardly knew they were there. The 1990 census shows 27,531 Native Americans in New York City. The American Indian Community House, founded in 1969, is a cultural and social support center strengthening Manhattan as a place of native homecoming. The Europeans who came here recognized the island as an ideal trade center, seeking to own the land Delaware people saw as their mother. Dutch, French and English all competed for Manhattan Island. From 1626 to 1664, the Dutch colonized it and called it New Netherlands. Although no deed exists, Peter Minuit, first governor of New Netherlands, reportedly “purchased” the island from native people called “Manhattans” (ironically, probably the Canarsie people from Brooklyn) for sixty guilders worth of trading goods in 1626. The English finally won possession of Manhattan from the Dutch in 1664, but Native people lost the most. Whenever I go to the city I would always feel a sense of loss and a sense of despair. One day I realized why I was depressed. The earth had been buried and all the spirits of the past had been trapped underneath the concrete and steel. And it was their cries that I felt whenever I came to the city. battles with Europeans for land and against diseases they brought killed vast numbers of Indian people. Yet American Indians never vanished from Manhattan. Although not as visible as in the seventeenth century, Indian people continue to survive and contribute to the city’s cultural landscape. Location. 40° 42.266′ N, 74° 0.814′ W. Marker is in New York, New York, in New York County. Marker is on Whitehall Street near Bowling Green, on the right when traveling south. Touch for map. 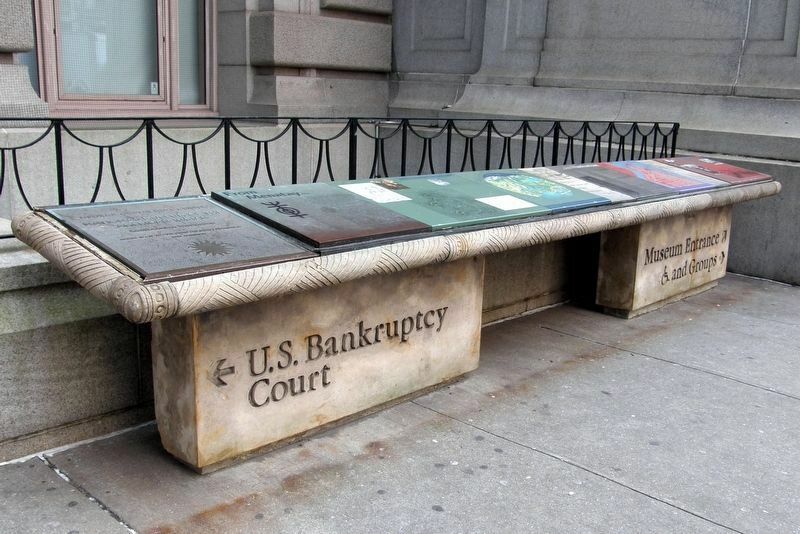 The marker is one of several in a bank to the left of the main entrance to the National Museum of the American Indian. Marker is in this post office area: New York NY 10004, United States of America. Touch for directions. Other nearby markers. At least 8 other markers are within walking distance of this marker. From Menatay... (here, next to this marker); A Place Of Many Names (here, next to this marker); Menatay, An Island Crossroads (here, next to this marker); Lower Manhattan Today (here, next to this marker); Drawn To The City (here, next to this marker); The Marketplace (a few steps from this marker); “North America” sculpted by Daniel Chester French (a few steps from this marker); Places of Exchange (a few steps from this marker). Touch for a list and map of all markers in New York. The bank of markers left of the main entrance. 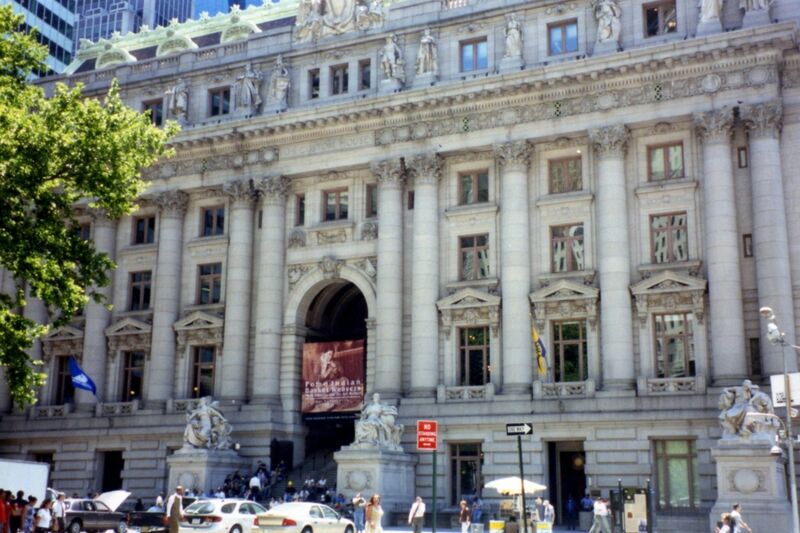 Formerly the Alexander Hamilton Custom House. The marker bank is to the left of the entrance. More. Search the internet for ...to Manhattan. Credits. This page was last revised on March 6, 2019. This page originally submitted on March 4, 2019, by Larry Gertner of New York, New York. This page has been viewed 47 times since then. Photos: 1, 2, 3, 4. submitted on March 4, 2019, by Larry Gertner of New York, New York. • Bill Pfingsten was the editor who published this page.